HALLE, Germany (AP) Roger Federer opened his Gerry Weber Open title defense by seeing off Aljaz Bedene of Slovenia 6-3, 6-4 on Tuesday. The world No. 1 broke the No. 72nd-ranked Bedene at the first attempt and again for 5-4 in the second set to wrap up the win. Fresh from winning his 18th grass-court title in Stuttgart on Sunday, Federer dropped just four points on his serve and forced seven break opportunities, taking two. 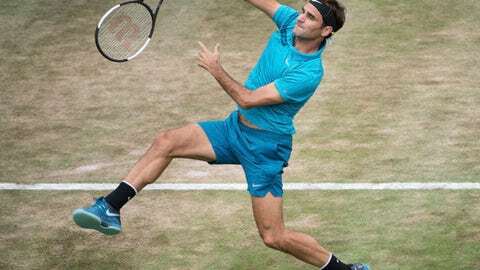 Federer made his comeback in Stuttgart after skipping the entire clay-court season for the second year in a row, and again he looked sharp as he extended his grass-court winning streak to 17 matches including his titles at Halle and Wimbledon last year. The Swiss great is just five match wins away from matching Jimmy Connors’ all-time record of 174 victories on grass. Federer’s winning percentage is better, with 169 wins and 24 loses compared to Connors’ record of 174-34. Federer is bidding for a record-extending 10th title in Halle, which would be his fourth of the season and 99th overall. Two-time finalist Alexander Zverev was upset by Borna Coric, 6-1, 6-4. The second-seeded German wore a bandage after tearing a muscle in his left thigh during his quarterfinal run at Roland Garros, and he said the injury was holding him back. ”At first I was afraid that I couldn’t play at all in Halle or Wimbledon,” Zverev said. Also, Stefanos Tsitsipas of Greece upset fifth-seeded Lucas Pouille 6-2, 7-6 (3), and former title winner Philipp Kohlschreiber progressed against Marton Fucsovics. There were also first-round wins for Andreas Seppi, Florian Mayer, Matthew Ebden, Karen Khachanov and Benoit Paire.